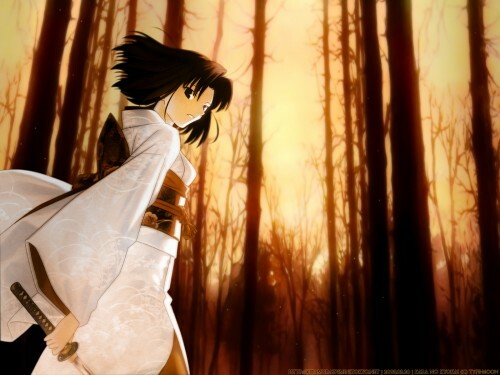 Featuring Shiki Ryougi from Kara no Kyokai, the wallpaper's concept (i.e. wandering in the forest) has been on my mind for some time. However, I didn't find a good scan to comply with it, so it was kinda left out... But then I found this Kara no Kyokai group scan a little while back. I thought it suits the idea well; hence the Shiki FG. For the BG part, I actually planned have more greeneries on it (that is, brushing to make all the leaves) -- but in the end I got a hunch that autumn scenery work out just better; which is the wall's final concept. The rest was more to finishing touches, e.g. playing on lighting and DoF. The tricky part? Mmm, it's gotta be while toning down the Shiki scan. X-P I want an autumn sunset, but it was toned down in purple shade. That said, I had to at least dye some parts manually to prevent the color-crash... which then resulted in the FG you can see up there. The bg is very nicely done and the "toning down" is really well done! Blends in beautifully with the background. Great job! you should catch the bug more often this ones a masterpeice love it! Ah, I want to see this anime when it gets released on DVD or so. You really did a good job at making the BG match the scan. i luv it.tho i dont know about the anime. She's pretty! I like the sword! top noch! both the character and the background is blend perfectly! good job! a simple wall, but the perspective and blending is perfect. Great job. love her white kimono .she looks so cool and the backgroud is unique . Muito obrigado pela imagem, realmente gostei. Kara no Kyoukai wallpaper is one of the hardest to find anime wallpaper.